The T2-31,8mm photographic adapter connects to all cameras and accessories that have a T2 female thread (42x0,75) and it is used to insert in 31.8mm focusers. On telescope side it has a 28mm thread to allow you to screw any 31.8mm diameter filter. 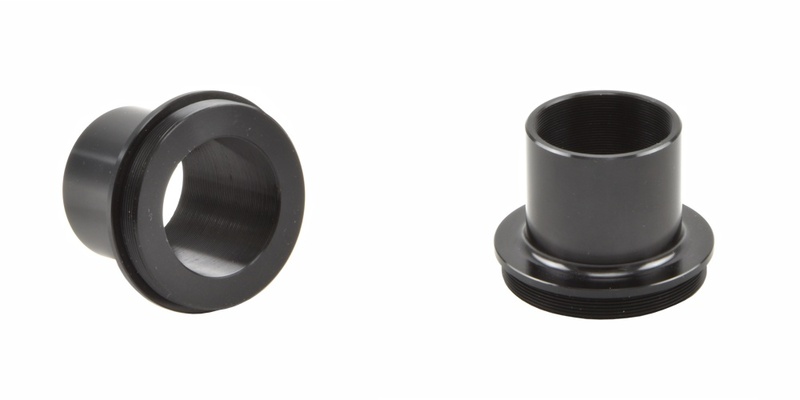 Built entirely of metal and fitted with black anodizing, it has a clear opening of 27mm. The T2-31,8mm photographic adapter can be used to connect cameras to telescopes. If you have a DSLR, just connect the T2 ring to the DSLR (after removing the lens), then you can connect this adapter. Warning: since DSLRs are usually equipped with a large sensor (APS-C with a diagonal of about 27mm), we recommend the use of our "T2-50.8mm photographic adapter". If you are using a CCD camera (which usually already has a front-T2 female thread), this T2-31,8mm photographic adapter can be screwed directly on the camera body. This adapter is fine for CCD cameras equipped with a sensor with a diagonal no bigger than 20mm, otherwise you get vignetting (decrease of light towards the edges of the sensor) caused by too narrow opening of the adapter. In both cases, you can connect the camera to any 31,8mm focuser and screw in front of the adapter any 31.8mm diameter filter (such as a filter to reduce light pollution). This adapter can also be used to connect to the focusers other accessories such as filter wheels or off axis guiders.